90% of marketers say crowdsourcing content from across their company has a positive business impact. Here’s how some companies make content creation a community effort. If you wish that more people in your company could—or would—help you create content, you’re not alone. In fact, 87% of the marketers who responded to our most recent poll expressed the same desire. Of course, that’s not terribly surprising considering that nearly one-third of our respondents have only one or two people who create all of the content for their respective companies. And while one or two people are perfectly capable of creating all of a company’s content, they might struggle to do so at scale. Why? Writing is a time-consuming task. In fact, 71% of respondents said that bandwidth limitations were by far the biggest challenge in getting others to contribute content. 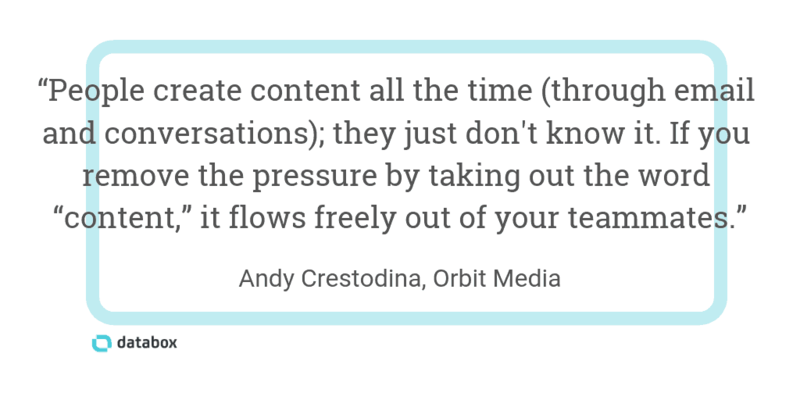 Beyond that, small teams of content creators may also struggle to cover a variety of topics. It’s extremely difficult to write about a topic you’re not a subject-matter expert on. You can lose days conducting research, and even after that, you’re never quite convinced that you completely understood and accurately articulated what you were writing about. It’s far better when you can rely on actual subject-matter experts from across your company to contribute their thoughts and ideas. After all, the best person to explain a technical issue to a technical audience is someone who works with that technology every day. And, the people who know the questions prospects need answers to before converting often work in sales and customer service—the people who spend most of their days answering these questions. 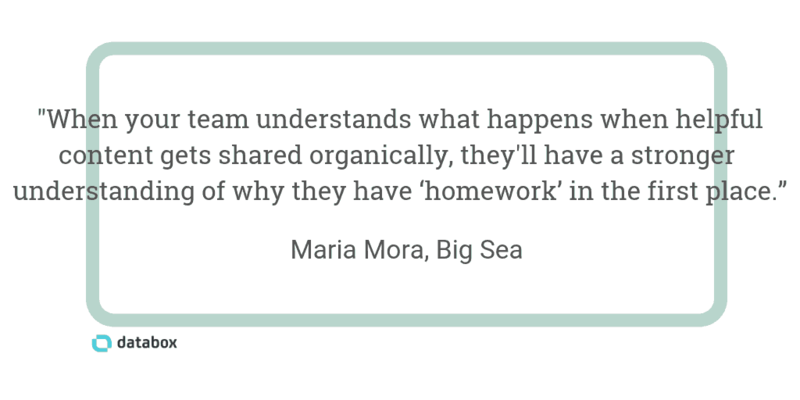 But how do you get individuals from other departments to help you create more content? To answer that question, we asked our respondents—the subject-matter experts on this topic—for their recommendations. Editor’s note: One of the most effective ways for motivating your team to contribute content (as suggested later in this post) is by sharing the impact that their efforts have on organic traffic. 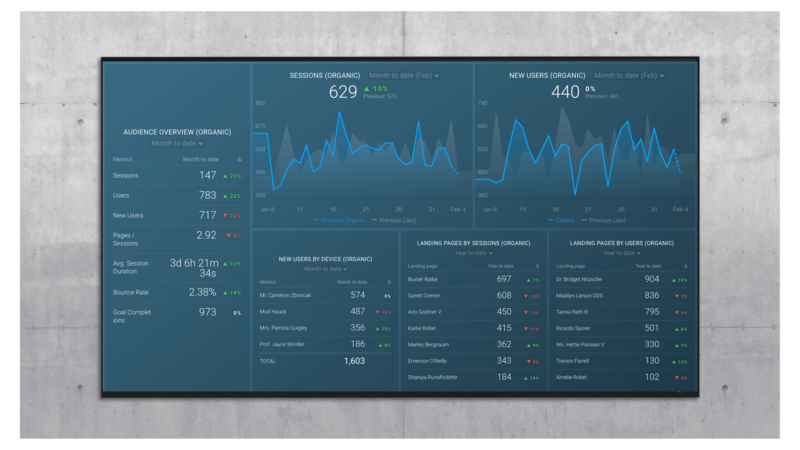 Grab this free dashboard to track how well your website is attracting organic traffic, what percentage of them are new visitors, the top pages, and more. “A good way to inspire more people to create content is to show them the potential effect their content could have on your consumers, your social media efforts, and your business as a whole,” says Alayna Pehrson of BestCompany.com. “The more positive results they can see coming from content creation, the more motivated they will be to contribute content,” Pehrson says. Rick Ramos of HealthJoy says it’s all about credit. In other words, playing into each individual’s innate desire to be recognized. 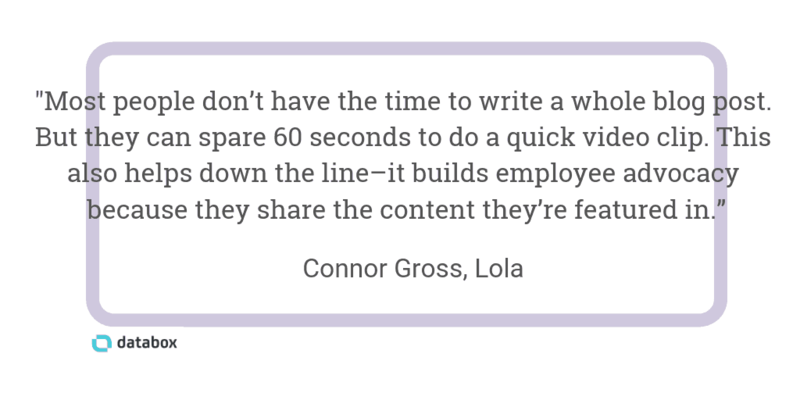 However, if you make it incredibly simple for coworkers to create content, it alleviates their concerns about time constraints and encourages them to contribute more often. 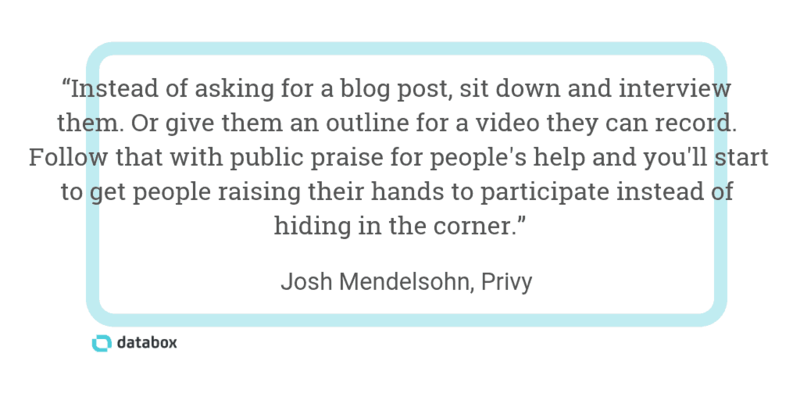 Our respondents offered several suggestions for how to make contributing content easy. “I find that the most effective way to get my coworkers to contribute content is understanding what truly interests them,” says Emma-Jane Shaw of Uku Inbound. Another great way to capitalize on coworkers’ strengths is to have them create content that’s related to their day-to-day actions and responsibilities. Another way to get people more comfortable with contributing is to make contributing a habit. AJ Alonzo’s team at demandDrive runs regular workshops to solicit and inspire ideas of others. “One of the methods I’ve found especially effective is getting my coworkers to contribute to HARO on a nearly daily basis,” says Anna Rubkiewicz of Survicate. Teaching people to write and giving them helpful resources will work for some employees, but for others, no amount of education or resources will compel them to write their own content. The bottom line is that some people just aren’t comfortable writing. 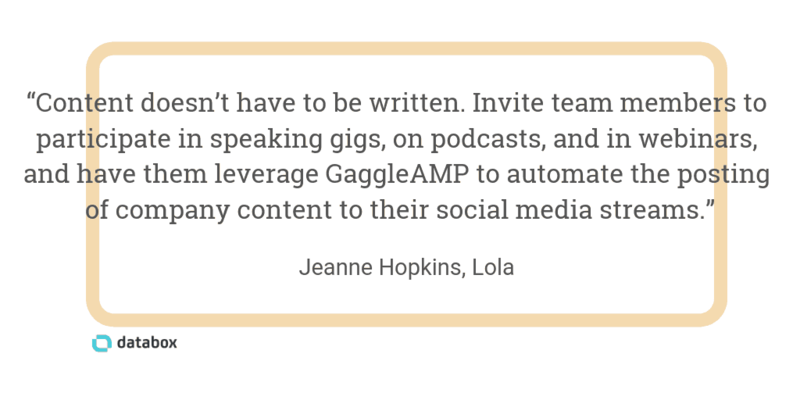 But even if your coworkers aren’t—and will never be—writers, you can still have them contribute to your content efforts by capturing their ideas and using those ideas to create content yourself. There are a lot of different ways to capture your coworkers’ ideas—none of which require them to write. “One effective way we inspire more of our team members to contribute to content creation is to provide them with an incentive,” says Jackie of Fisher Unitech. You can try tricking people into creating content, teaching them how to write, explaining why it’s important, or giving them rewards, but at the end of the day, one of the best ways to get people to share the responsibility of content creation is to build a company culture that values it. Plus, getting more people throughout your company to create content, according to nearly all of our respondents, has a positive impact on your business. 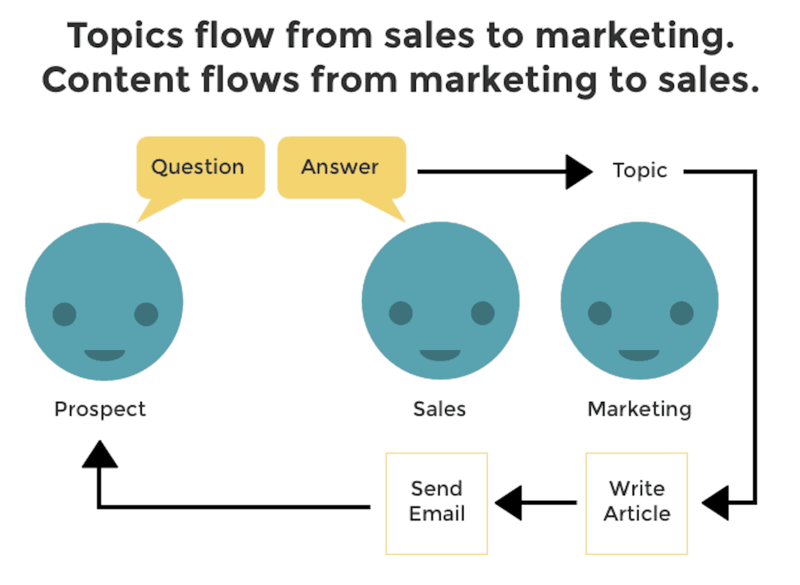 Jessica Greene writes about marketing, business, and technology for B2B SaaS companies. 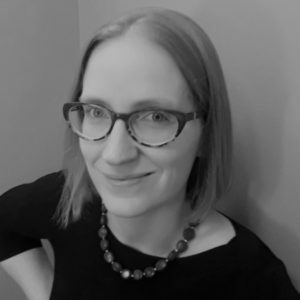 A former writing instructor and corporate marketer, she uses her subject-matter expertise and desire to educate others as motivation for developing actionable, in-depth, user-focused content.